Side note: I have two projects in this issue. Both for Hanukkah. (we are not Jewish, but LDS) We have friends that celebrate Hanukkah and now I am elated to have something for them! I think Hannah took this a little to literally, don't you? HAHAHahaaaaa... seriously... she is trying to help me out in this pic. Pepper left a bunch of crayons in a bag that ended up in the load of laundry... then the drier decided to cook them into the entire load! I was completely freaked. I immediately went online to figure out what to do. 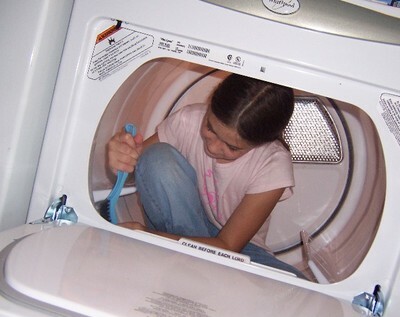 Once I got it all sorted and started washing the speckled load I started cleaning off the dryer drum. this lasted only a few moments before I realized that my neck was really irritated with me for attempting it. Hannah volunteered to take on the task. She decided to hop on in to get the most optimal view of the crayon that was now plastered to the drum completely hardened. this was just too cute to NOT snap a pic of... then I started rolling when I went to edit it.... Clean before each load. Hahahaaaaaaa! I love it! BTW.... if you happen to get into a war with melted crayon's... was your clothes in HOT with borax... took it ALL out... three red and orange crayons too! Sometimes my gut just knows! it's those rare times when all the stars align and a project turns out more beautiful than I ever anticipated! Those are the times when I just know it will get published, eventually. LOL! This time I hit it on the nose right out of the gate... and it feels good! I feel so blessed when I get something accepted for publication... even more so when I LOVE the project! I don't usually talk about my acceptances... but today it just felt SO good to get that acceptance from Paper Crafts for two of my submissions. I feel such a sense of accomplishment... there is something magical about making and seeing goals accomplished! One of the items was one I alluded to in a previous post... I feel like someone else created it...mainly because I struggle thinking I am a great designer... and this turned out great! it's shabby and feminine... very warm. 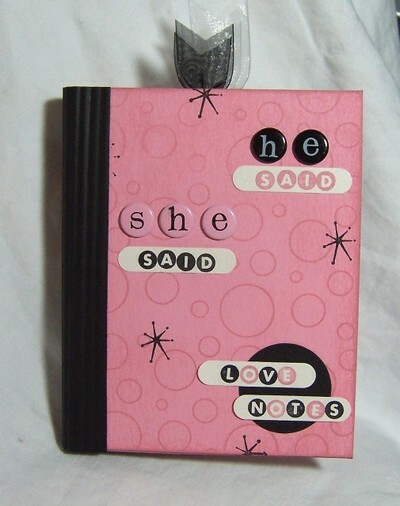 SO... look for the March 2007 issue of Paper Crafts for it... hopefully you will see what I mean... and why I am in love! alright... here are some little magnets that I made... I am going to use them for the girls school papers on the fridge. Nothing fancy... but the girls are excited! Part of the fun of what I do is being able to cross market companies who's products I love... it's like baking. I love sugar and spices, chocolate, vanilla all by them selves. But add them together and a magical concoction is created! And so it is with Marvy and A Muse in this ad. there is nothing like a scalloped punch with an A Muse image! 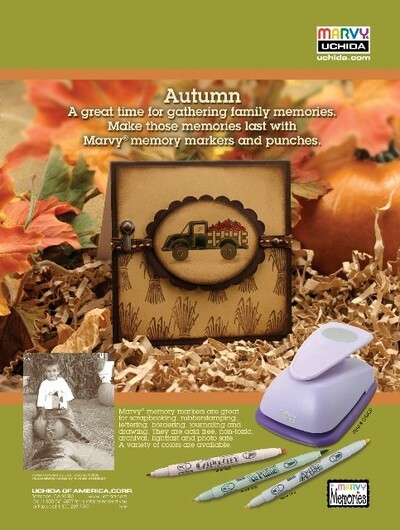 See this ad in the upcoming Creating Keepsakes! 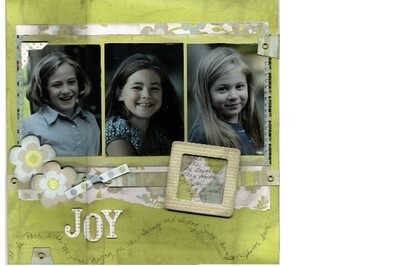 just a quick page I created using We R Memory Keepers products. the little frame is actually a shaker box journal square. we went to the beach over the weekend. 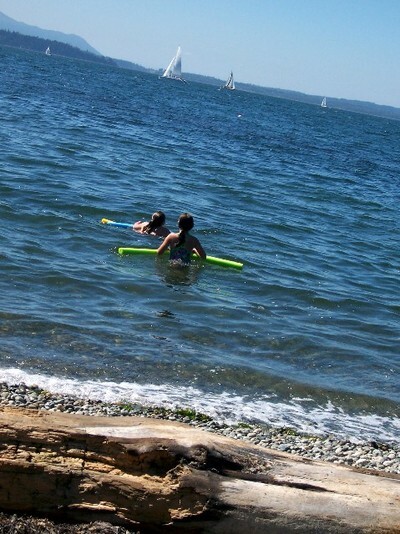 Bellingham doesn't have much sand on it's shores... but it's fine for a few hours being that it's only ten min away! this was such a cool day because of the sailboats that were in multitudes in the bay. the girls were just floating there watching them... there was a nice breeze... and a hot day. Today is a deadline day. this whole week is full of those... but I had a magical creating day yesterday. I had one of those days where designs just click! I made 3 projects that may just be my favorite of all time. and they were with PATTERNED PAPER! *shock* I tell you... I was made to work with We R paper! One is SO pretty that I may just change my DD's room just so it has a place to hang! very soothing... rich and shabby all at once. ( I hate not being able to show it right now, but I submitted it) Hopefully you will see it in print! so... with the large amount of posts... (Ella can't count that high) we came up with a new system... 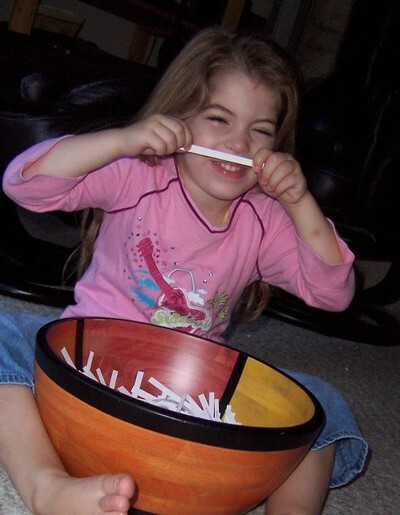 I printed all the names, cut them and Ella picked from a bowl! She is SUCH a ham! 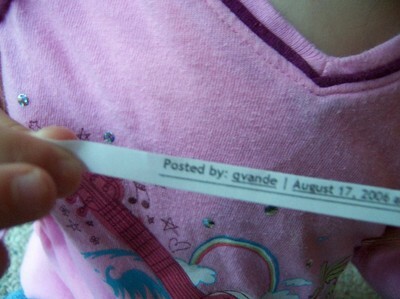 So...Gvande... shoot me an email with your snail mail so I can get this out to you! sneaking over to her side of the house to bum candy off of her. She had a MIL apartment for years off of Chris's parents home and always had licorice and gummy bears. her complete candor the week before we got married... I was blushing on the outside and cracking up inside! her ability to take Chris' teasing her...jesting is more like it. he would give her such a time of it because he knew he could get by with it with her. the girls going shopping with her to get a new outfit. this is so cool, because it was a big deal for them and they remember it! We got the call late last night... today has been a family day. not somber... we just spent time together. We knew it was coming. we love her and just wanted to share a few memories here so that they are written down... journaled for postarity's sake so to speak. there is something magical about sending something that you know will bring a smile to someones face. this is WHY I like to do give aways. so often people look for an alterer motive... with me... a rose IS a rose. I honestly get a desire and act on it if I can. I believe that is the same drive with out question that has led me onto the path of design work, both concept AND product. I create art directly FOR the manufacturers for their trade shows, catalogs, online marketing , television programs and national advertising. I write articles about how to create art as well as use the products. now concept designing has led me to product design. it is a natural progression. I keep saying... I wish I had "this" or "that" ... well thats something that leads to product development. necessity really is the mother of invention. I feel really blessed to work with some very fun Manufacturers and most recently Tsukineko sent me some Spectrum Pads for the Stamp It! call. I again received duplicates of their original spectrum pad... I called them up to see if I could give it to one of my blog readers! Sooooo... here we go. Yippee! Thanks Tsukineko! I will also inclue a super cool surprise products with it. *sneaky giggle* don't you need stamps with an ink pad? Post a comment to this post and come back on Sunday to see if you've won! We R Memory Keepers is in the house! I was so excited to open the door on Friday to find some goodies. OOooo....I feel like I died and went to We R Heaven! I am so excited to work on my Design Team assignment for this month. now...I admit... in the past I have proclaimed a pattern paper aversion... but creating with We R comes pretty easy for me... I honestly think it's because their papers have SO much color depth and shading! here is one of the cards I whipped out. 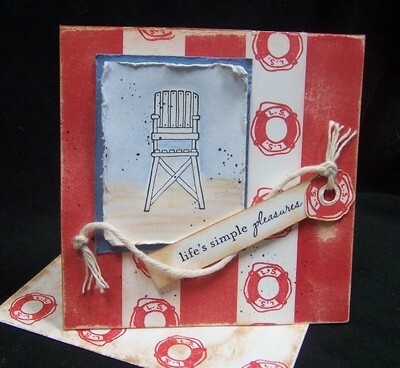 I used note a note card and some paper from We R Memory Keepers Summertime line. 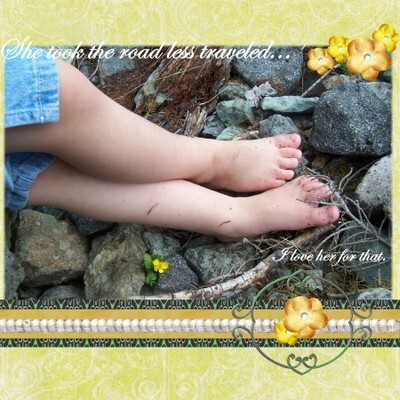 I also used my favorite flower image and sentiment from A Muse. 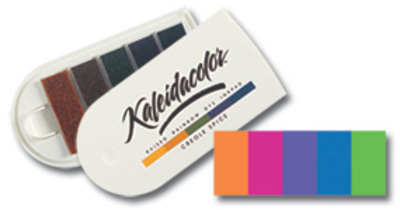 Colorbox fluid chalk inks are the perfect complement to their papers as well! did I mention that this is my favorite A Muse flower?! hopping onto the beach and running my toes through the sand. I think it's amazing how memories can be triggered to the point of even remembering how it smelled... the breeze on my face... I was so young and I remember it like it was yesterday. I hope my girls will remember. SOOoooo...... It took me an entire year to save up enough money to book this vacation we are going on. I am incredibly excited AND nervous. Excited because Chris and I have never gotten away together... not even a honeymoon. Nervous because we will be gone for 12 days. How am I going to be with out hug and kisses from all my girls for that long. Ella will be the hardest to leave... she is a total mommy's girl and I admitting love that she is! I know that she will have a little bit of a hard time so I will try to prepare her. (and the other girls) We have some fun friends that are coming here to watch them and they have a little girl... so I am hoping that will be fun for her. The kids were a tad miffed when we told them what we finally decided to do..(until they learned that out awesome friends we coming to stay here! ).I mean... who goes on a Disney Cruise without their kids anyway? *blush* we do. Disney had this amazing special and we jumped at it. They really know how to put on the dog too. .. there was a show on the travel channel that showed everything ... so elegant! So we are going for out 14 year anniversary to the south Caribbean. I am still in SHOCK! this may be the only on in my lifetime.... so I am going to snap pics and run my toes through as much white sand as possible! ooops... I forgot to say that all the images and note cards are A Muse! 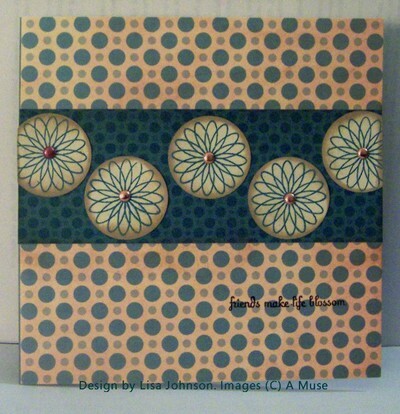 I created this tag book and card for Paper Trends June/July issue. 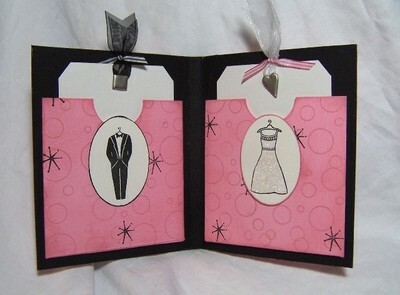 I was elated when it got a two page spread!...I love Pink and Black together! I used A Muse images, SU Paper, Clearsnap ink, Queen and Company brads. Simple glitter adorns her dress! 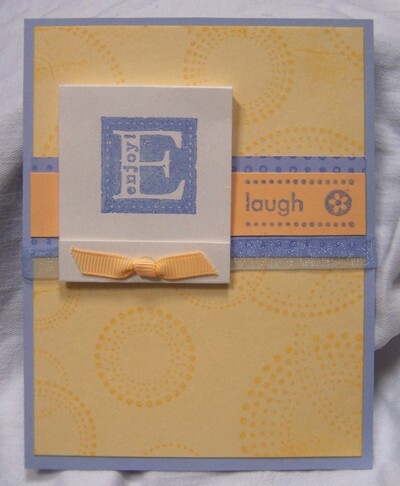 I created this card for my display stamper job for SU. I really love this set and loves having soft subtles to work with. One of my goals was to try to create some clean creations. Mine are usually a bit shabby and while I love that... I want to keep versatile. I used craft ink to keep the colors deep. it took every bit of will power in me not to DTP this puppy. I am sure it still needs something... but at the time I had to put it down or not meet my goal! LOL! I died and went to heaven... I kid you not! I am a lover of all things sweet... add something coconut to it and I swoon... well to be honest... I eat a ton of junk... but coconut has been a summer fav this year. Anyhow, I was at costco... our typical Friday night date. (harhar) and of course there was a "try me" (as my kids would say) of these cool sorbet's geniuosly contained in a natural fruit wrapper... OM GOSH!!! The coconut was IN-CRED-AHHHHH-ble. it took me all of 3 seconds to head over to the freezer and exclaim... "these puppies are MINE!" At this point Chris rolls his eyes in a "curse you, but I love ya" kinda way. PLOP... into the cart and off to the checkout. Now... I strategically made my way over to the food area while he paid for our haul and spied some plastic spoons. I covertly grabbed some and zipped back before I was missed. with spoons in hand and a mischievous plan... we left costco. Hannah was with us and since she has that eagle eye sense... the spoons were revealed... "Yipeee!" she exclaimed ... I look at her with a put-on confused look. HUH?...What? Then I proceed to whip out the spoons and a coconut sorbet that is in an actual coconut shell! one smooth creamy bite... *sigh* Pure delight I tell ya! Now... sharing is a great thing to teach your kids right? well.... there are only 2... that's right 2 coconuts in the entire box. Hannah wanted a coconut.....................................She really enjoyed the orange one! Island way... check them out! I love when something I have worked hard on gets picked up for publication. This was in PaperWorks... but they didn't have room to show you what was inside. To me.... that's the best part! 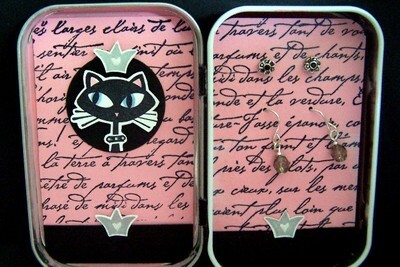 this altered Altiods tin has a raised bed on the earring side so that the earring posts have room. I love using images that seem "cute" to create something elegant. Here is a little Digi page I created with one of my new fav photo's of Ella. I love that she seems to take a different path... it sometimes scares me... even though it's usually safe and way more fun than the path I would have chosen. Her paths are truly unique. 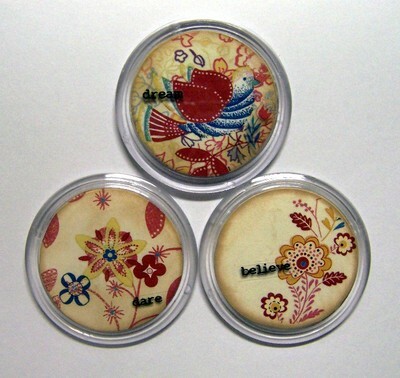 Digi kit by Shabby Princess.